Nassau County Executive Edward P. Mangano congratulated the 126 graduates who attended a ceremony held last night at the David Mack Arena on the campus of Hofstra University. Hempstead, NY - November 8th, 2014 - Nassau County Executive Edward P. Mangano congratulated the 126 graduates who attended a ceremony held last night at the David Mack Arena on the campus of Hofstra University. The graduating class consisted of 124 graduates who will be joining the Nassau County Police Department, and 2 graduates who will be joining the Glen Cove Police Department. County Executive Mangano is pictured along with Acting Police Commissioner Thomas C. Krumpter presenting Police Officer Richard A. Mosback with both the Academic Excellence Award and The Combined Overall Excellence Award. For information on all the benefits of joining one of the largest and most respected police departments in the nation, click here. 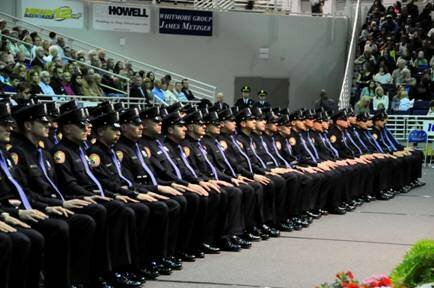 Subject: LongIsland.com - Your Name sent you Article details of "Mangano Welcomes 124 Graduates To The Nassau County Police Department"